This is a wonderful little program that saves me a lot of headaches. It is very easy to use and customize. Well worth the minor cost! A couple of things I would like to see added: a pause button for the timer and secondly an easy way to archive certain things such as a customer I no longer do work for. All in all I would certainly buy this program again. Great app for contractor with multiple jobs. I have used this app for years now and love it. I wish there was an easy way to sync with my QuickBooks customer base so that I wouldn’t have to manually enter the time entries. Maybe there is a way but have not been able to figure it out yet. I have been using this app for a month, and have found it to be very responsive. To date I have been experimenting with different category set-ups, and cannot give a final grade until I am fully satisfied I understand the limitations. It is surprisingly and pleasingly user friendly and intuitive. The more I work with that the more features I find that I like! I’ve been using TimeTracker for the past 6 months regularly as a consultant and it has been a real benefit to keep track of time and tasks for billing. I like the ease for entering time and specific tasks, by client or project, and the export function has been easy to use to import the data into excel for generating reports for my clients which I attach to invoices. Highly recommended. I’ve use several time tracking systems for my engineering consulting business. TimeTracker is my favorite. It is extremely reliable. I have tried a number of trackers to log my hours as a consultant. This is the best. Thoughtfully crafted. I have not had any glitches. I love the app, but it often sticks for a long time when trying to save something. Wish that could be fixed. It operates well. Sticks occasionally have to wait for it to catch up. I've been using this app for 2 years. it does everything I need plus more!! Very useful and easy to put in place. I’ve been using this app for about 2 1/2 years and have had excellent results. I do home repair at multiple jobs at the same time and this app makes it easy to keep track of the time spent at each location so that I can charge my customers accurately. Thanks! Love the time tracker program. It is a great help for me in keeping track of my hours. This is a terrific app and does everything I need for my job. I just input hours and task each day then at the end of the week I just email to my company. So much easier now. Thank you! I’ve been using time tracker for a while now. I love it! Helps me track work for several companies. Allows entry of breaks and also helps track tasks. Being allowed to enter a percentage per task would be a useful addition for me. But tasks come through like notes so it is possible it just wouldn’t tally them for the pay period. 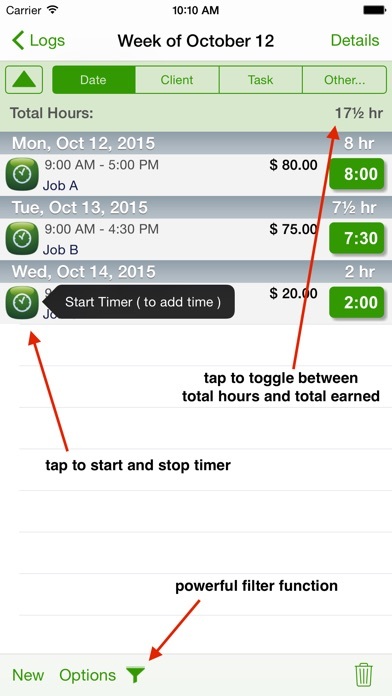 You can also set different pay rates for your time logs. I’ve never had trouble with it. This is a great app for tracking your time. I work for a CRO with lots of different clients and tasks. Timetracker keeps them all straight, and it so easy to track your time spent on each project by simply starting and stopping the timer. That's a real time saver when you jump between projects as often as I do. I use it for my consulting services and it's super useful and straight forward I recently discovered the iCloud backup and export, and I like it a lot. For Airmail users, it would be nice to add other email clients, but iCloud export is a good workaround. Great way to keep track of my time. With twice a month pay period things got missed, and this app is perfect for daily time tracking. VERY FLEXIBLE for those who need to keep detailed labor records for hourly-rate customers or projects. I’ve been using it daily for over 5 years. Highly recommended. Developer listens and responds to the users’ requests! Great app. Can track multiple clients with multiple projects. Clear printout broken down for submitting for invoices. Get it !!! Takes a little time to understand terminology and how to use. Once you figure it out it’s a very helpful app. 3rd review 10Aug18 Still love the app although it keeps asking me to review. Wish list - add a pause work feature. 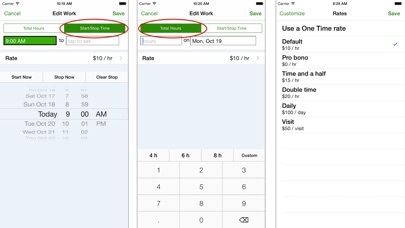 Add a week summation of hours feature. Other than that it’s a great app. 2nd review 29Sept17 Would like to see ability to set a specific numbers of hours able to work per week. So it shows hrs worked against allowable with a balance left. Some clients dictate a discreet number of hrs per week and currently keeping that Planned Vs Actual hrs per day/week in spreadsheet on my phone. 1st review 27Sept17 Great app. Have already recommended to others. Will provide more review in future after using 30 consecutive days. I got this app to track freelance work that I do sporadically, so my needs are pretty simple. I can easily track my times by project and client. When I need to generate an invoice for billing, I just use the built-in invoice template (fields are user selectable, so you don’t have to show any info you don’t want to). I like that there are options for different file formats in the export function, and it’s great that I can send an email with the invoice attached from within TimeTracker. Overall, the app is pretty intuitive to figure out. It helped when I had some real clients and projects to set up and track. I recently had a problem with the invoice template when I exported it as a PDF, so I contacted the developer. He responded very quickly, asked for some more info and screenshots, and sent me a new template to fix the problem within one day. He took the time to explain exactly how to put the new template in TimeTracker and had a helpful hint about using the app too. Whenever my freelance work expands, I’m confident TimeTracker will remain useful. There are tons of built-in features that I don’t need now, but could be critical in the future. When I searched for a time-tracking app, I looked for quick data entry and the ability to do several job types at different hourly rates in order to track my freelance work. Also, I needed a way to use the log data to create my invoices. Finally, I didn’t want to pay a lot. Time tracker does it all. The interface is intuitive, simple, and easy to use. The developer quickly responds to any questions you may have. I’m finding this app integrates seamlessly into my work day, which is exactly right. This app does everything I need it to do. Also, it is extremely simple to use. Love it. Still feel this way 2 years later! I have used this app for years and it has been tremendous and rock solid. On a recent release, I ran into a bug in that caused crashes under certain specific circumstances. I reported it to the developer and it was fixed within 24 hours. Absolutely superb support for an outstanding app. So disregard my low review of last week. I have been using this for a while now, and with the latest update, it is even better. It has proven to be very convenient for keeping track of time for multiple purposes simultaneously. Switching from one project to another is very easy to keep minute level accuracy is readily done. Generating necessary reports is easy, too. Since the newest update, it no longer works on the iPad Pro. It simply crashes when trying to make a new time record. Pleeeeeeeeease fix, I depend on this software to run my business. UPDATE: The very next day, they pushed an update that fixed this issue. 5 stars. Thank you for your hard work! I can't do any entries since updating to 10.20. Any solutions? It's been a great program for me these past 6 years so hoping this is a bug that can be quickly fixed. It's a little cumbersome and I wish there were an instant clock in/out function, but otherwise a nice, thorough app. I can’t get the app to sync between my 2 devices. This app had a lot of thought go into it and has more features than I will ever need. I purchased the sync add-on which allows for the syncing of data between the iPhone and iPad. It is not very dependable and find myself have to manually sync most of the time. This means I need to take the time to insure when I state one device should overwrite the other so that I do not lose any entries. Kind of scary. This is a fabulous product series that I have used to record all of my billable hours for eight years now. When it comes to track my time with and on behalf of clients there is no other app I would trust with my money in quite the same way. I’m so grateful for the stability and reliability of this app. It’s also easy to use and they don’t keep your precious customer data on their servers so you are not opening them up to as many data breaches. 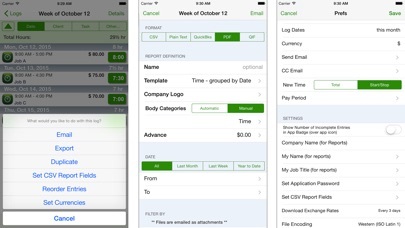 I use the app to keep up with my time as I am an contractual employee. This a great tool. Couldn't ask for a better time tracking app for a sole proprietor. Very practical and in-depth app. Highly recommended app! Makes pay per hour tracking and calculating SIMPLE & ACCURATE! 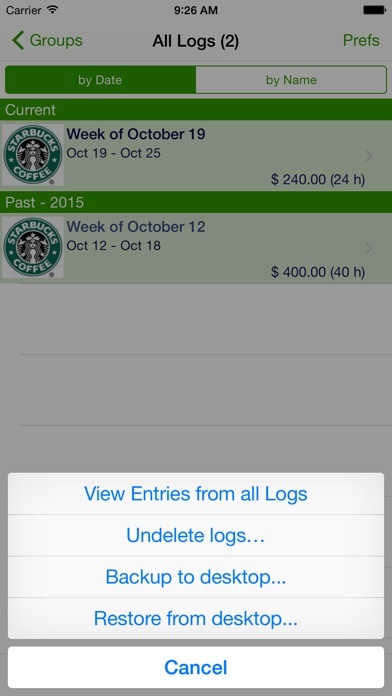 Easy to use; especially like the ability to automatically transition hours into an invoice. This is a great app. I have found it very useful and relatively easy to learn. I use the program all the time, it’s great as far as functionality and flexibility to record my client activity... but over the last year or so, it began to freeze up... I’ve been hoping for an update that would correct the issue, but hasn’t been one.. and it is very frustrating when it freezes up after you’ve put a bunch of narrative in and now you have to close it out and try again. If that problem didn’t exist, I would have given it 5 stars. This time tracker is being used for tracking an independent study project. It’s great for exporting in PDF, it makes submission easier. It tallies hours and minutes in real time. Would love to figure a way to get rid of money section as an improvement. I have mine set to pro bono which works fine. Could be very useful for billing. Love being able to export, or email data! A real time saver and so easy to use! If you split your day between several clients or customers, each with multiple projects, this is the perfect app to track your time and prepare timesheets and invoices. I use it every day. It understands the client/project/task hierarchy and different bill rates. I'm particularly happy that the app is not continually "improved" to the point of becoming useless bloatware. Clean, simple interface that does what is needed. If the app keeps nagging me for yet another review, I will take away a star. 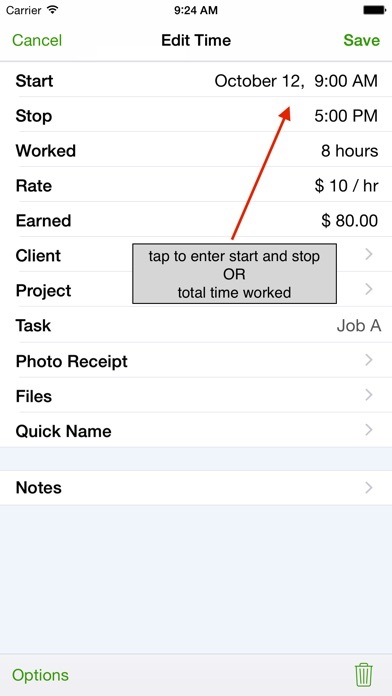 The best time and task app on the market in my opinion way to go developer.... the only suggestion I have is to add a field for draws or paychecks for reports other than that... PERFECT!!!! Easy to use. Keeps great detail on phone/tablet and cloud. If you have a question, the app builder responds person and quickly. Fantastic for no-frills timesheet needs! This is s great tool for fracking my projects. Very counter intuitive. Seems best for people with fixed schedules. The best time card I have used.